For many people, budgeting is challenging not because of its tediousness, but because of the math. Numbers make them cringe. If that's you, here's how to get past your dislike of digits and get in the budgeting game. Budgets get a bad rap. People who don't use one tend to hate the very idea of a budget. It sounds so constraining. It feels like so much work. But people who use a budget say it's actually freeing. There's peace of mind that comes from knowing where their money's going. That knowledge gives them the power to make proactive decisions about how to best use their money. That perspective can be really powerful. While this article will minimize the math involved in using a budget, some will be required. What'll take the edge off is accepting, at least on faith, that using a budget will be beneficial to you. Planning is the first of three essential steps involved in using a budget. That means deciding how much you're going to divvy up your dough — how much to save, invest, and spend on everything from gifts to groceries. This is usually the most math-heavy part of the process. But there are plenty of guides available, including the free downloadable Recommended Cash Flow Guidelines I created, which shows how much you could allocate to the most common categories based on household size and income. Download the Excel version of the Cash Flow Plan as well and enter the recommended amounts from the Cash Flow Guidelines as a starting point. Then customize your cash flow plan based on your priorities. You may value vacations more highly than buying new clothing, so adjust accordingly, making sure that in the bottom right corner, outgo equals income. At very least, the guidelines will help you avoid having to start from scratch, crunching lots of numbers to figure out how much to allocate to this or that. The second of the three essential steps involved in using a budget is tracking where your money is actually going. This can be tedious, and is often where first-time budgeters bail. Keep in mind, this is not a one-size-fits-all process. There are a variety of tools you could use. The best is the one you actually will use. Among the many options available, two are especially well-suited to those who don't like math. First, there's the envelope system. With this approach, you'll write checks or use electronic bill-pay for expenses such as your mortgage or rent, utilities, and insurance. For discretionary expenses, where spending can vary and you have to be more intentional about managing your spending, you'll use envelopes — one for each category such as groceries, entertainment, and clothing. If you get paid once a month and your monthly clothing budget is $100, you'll put $100 cash in an envelope marked "clothing." You'll take the envelope with you when you go clothes shopping, make your purchase with money from the envelope, and put any change back in the envelope. If you're paid twice a month, you'll put $50 in the "clothing" envelope each time you're paid. The envelope system requires very little math. At a glance, you can see how much money you have left to spend until the next payday. Second, there are online budgeting tools. The beauty of online tools, such as Mint.com, is that they do much of the math for you. Your job is to enter your budgeted amounts for each category and then link your checking and credit card accounts. Your online tool of choice will then automatically capture your spending (you only need to manually enter cash transactions) and show you how your spending in each category compares with your budgeted amounts. With just a few quick clicks, you can see how you're doing this month, this year, or other time frames, and the information is available to you anywhere you can get online. The third of the three essential steps involved in using a budget is reviewing how you're doing. If your groceries envelope became empty two-thirds of the way through the month, or if the groceries category in your online budget tool showed the same, you either need to allocate more for groceries or get more proactive about how well you're stretching your grocery budget. Getting the allocations right may take a few months, but it doesn't require much math. You just need to shift dollars from categories where you have money left over each month to those where you need more. 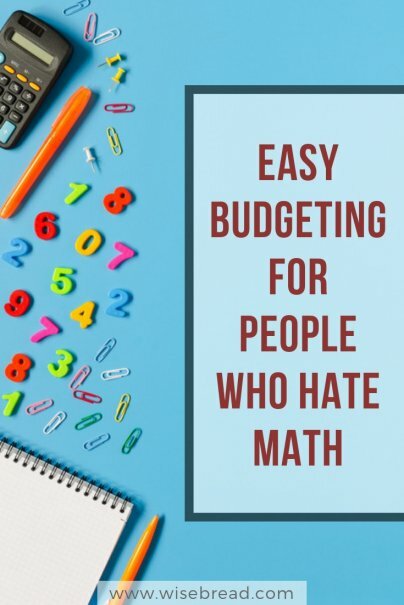 Don't let your dislike of math hold you back from using one of the most powerful tools available for wise money management — a budget. The envelope system is a simple way to proactively plan and manage your spending with no number crunching required. Online tools bring a lot of sophistication to the process, while doing most of the math-related heavy lifting for you.